The end time and events will affect every person, family, community and nation on earth regardless of age, race, location, government, religion, beliefs or practices. Everyone needs to understand as much as possible the coming end of time on earth. The end times (also called end time, end of time, end time events, end of days, time of the end, time of the end, last days, final days, the end of the world, close of age, end of earth, rapture, end time on earth, time of the end of the world on earth, end of this present world, armageddon, judgment day, eschaton, doomsday), was predetermined long ago. Through the first book, “The End of Time Mysteries Unveiled”, (released March 2017), God has unveiled to this generation the coming end time which had been shrouded in mysteries for centuries. Daniel was told ” the words are closed up and sealed till the time of the end”, (Daniel 12:4, Daniel 12:9-10). Through a series of visions, revelations, and understanding received by the author, the ancient prophecies, revelations, and mysteries of are unveiled as the earth is made ready to enter the end time. These along with supporting scriptural and other references are contained in the new book, “The End of Time Mysteries Unveiled”. Using very simple language for the readers to understand, the book unveils the long hidden mysteries, including sequence of events, from Genesis, through Daniel to Revelations. This book is highly recommended for everyone to understand the details and the sequence of end time events planned long ago by God. Get one for yourself. Get also for your loved ones, those you care much about. . Remove The Anxiety – Get A Copy For Yourself, Family & Loved Ones. When God warns of what is coming, He also provides guidance and solutions, for those ready to receive it. 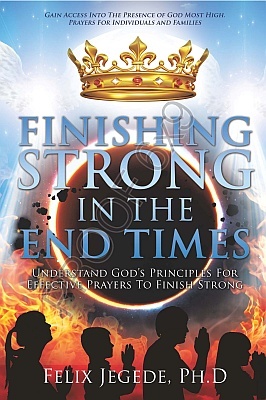 This is what He has done through the second book, “Finishing Strong In The End Times”, (released June 2017). As the world enters the end time, iniquity and misery will increase, while righteousness and peace diminish. Individuals, families, communities, nations, and the world will experience greater and unprecedented onslaught of spiritual, physical, health, security, natural forces and disasters, (including earthquakes, wind storms, hurricanes, tornadoes, flooding, mud movements, fire, etc in various places), wars and rumors of war between nations, along with economic, emotional, and psychological challenges. Alongside this is the good news of God’s help and deliverance that is available to all. Those who accept it will stand firm, be delivered and finish strong in the end. This second book reveals the principles on which God operates. It reveals how to get effective help from God through prayers in the time of the end. It also contains several prayers and guides for various situations that are either already being experienced or will challenge individuals, families and communities in the time the world is entering. Avoid Being Pillaged by End Time False Prophets & Deceivers, Recognize Them. 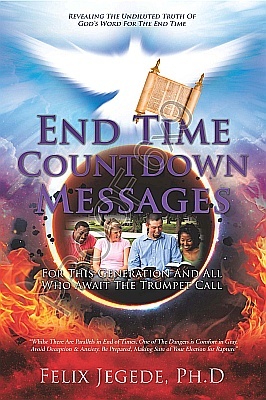 The third book, “End Time Countdown Messages”, (released October 2017), is for everyone in this generation and especially all who await the trumpet call. It contains the undiluted truth to overcome end time deceptions. Many being blinded and some taking comfort in gray will be pillaged and plundered by the false prophets and shepherds. Many being purified by truth will experience joy and celebration which will escape others. You shall know the truth and the truth will set you free. Many perish for lack of knowledge of the truth. Get one for yourself. Get also for your loved ones, those you care much about. 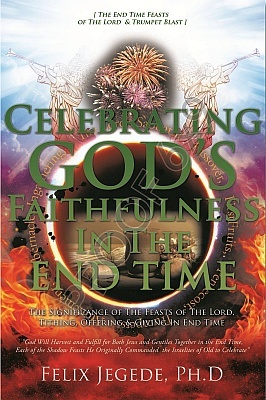 This Fourth book, “Celebrating God’s Faithfulness In The End Time”, (released May 2018), reveals the coming End Time Harvest Celebrations and Feasts of the Lord. Farmers harvest and celebrate Feasts. God is a Farmer, (John 15:1). God will harvest and fulfill in the End Time each of the Feasts He originally commanded the Israelites of Old to celebrate. God will lead and give each of the seven Feasts their full meaning in the End Time. The celebrations are focused on the household of the Lord, which is divided into four groups or composition as He returns. Each believer will discover which group they belong, and not all will be invited to participate. In the meantime, the Church being in a lukewarm state, is abusing the earthly harvests the Lord has given to celebrate till His return. The book provides understanding to the Church, pulpit, believers or worshippers alike, on Offerings, Thanksgiving, Tithing, and Giving. With the end time focus by many pulpits on money, prosperity and wealth generation, God’s original intent and purposes have been high-jacked and being abused. The result is tension, suspicion, contention, rebukes and even division in the body, which ought not to be. The book shows how to avoid potential abuse, by doing it in line with God’s end time purpose and desire,that is pleasing to Him. Finally, the book reveals the Devil’s End Time Weapon On Believers, effectively adapted from his victory over Adam & Eve in the Garden of Eden. With a seemingly harmless ‘fruit’ of fig leaves in end time, believers, ministers and members alike are being defiled through agreement with him. Believers should understand and take hid. God is a Farmer and this generation is His second season of farming on earth. 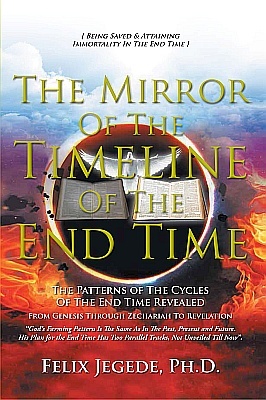 This book, “The Mirror Of The Timeline Of The End Time”, reveals God’s farming process with identical patterns for the past, present and future seasons. The book reveals God’s objectives, plans and timeline for the coming harvest of His crops (God’s people) for this generation. The book also reveals the number of those to be saved and God’s plan for them. It further reveals God’s parallel steps to establish His Kingdom on earth, with His Son as the King and Priest, just as this second season ends and The Millennium, the third farming season starts. 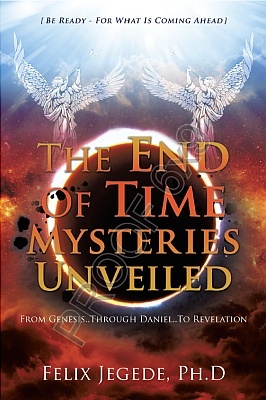 The book removes the fogs, like from a misty mirror, concerning the end time revelations and prophecies to provide clarity, connecting them clearly, including those not previously unveiled till now. The Time of the End on Earth or the human world had been prophesied long ago, in the bible including Daniel, Isaiah and Revelation. However, it had been kept shrouded in mystery till the appointed time of God. “And he said, Go thy way, Daniel: for the words are closed up and sealed till the time of the end. 10 Many shall be purified, and made white, and tried; but the wicked shall do wickedly: and none of the wicked shall understand; but the wise shall understand”, (Daniel 12:9-10). What was previously shrouded in mystery for ages, is now revealed in full, at God’s own timing and manner. God has unveiled the details, along with His help available and also how to avoid being deceived for the end time. These are contained in the three books, which together provide an invaluable, timeless and priceless collections and aid for the individual, family, church and community for the time of the end.